Calling all high school Senior’s or college students interested in learning and developing the basics in sports announcing. The Stadium Stars Program and Hawaii Sports Program, which started in 1994 has been a stepping stone for Hawaii’s teens to learn the game while taking the opportunity to experience the “behind the scenes” footwork, is now accepting applications. Stadium Stars participants obtain valuable “on the job” lessons through developing pre-game preparation, calling live high school games, and working as a team to deliver a successful game plan. As a special family memento, Stadium Stars events are available for purchase on DVD through the Stadium. 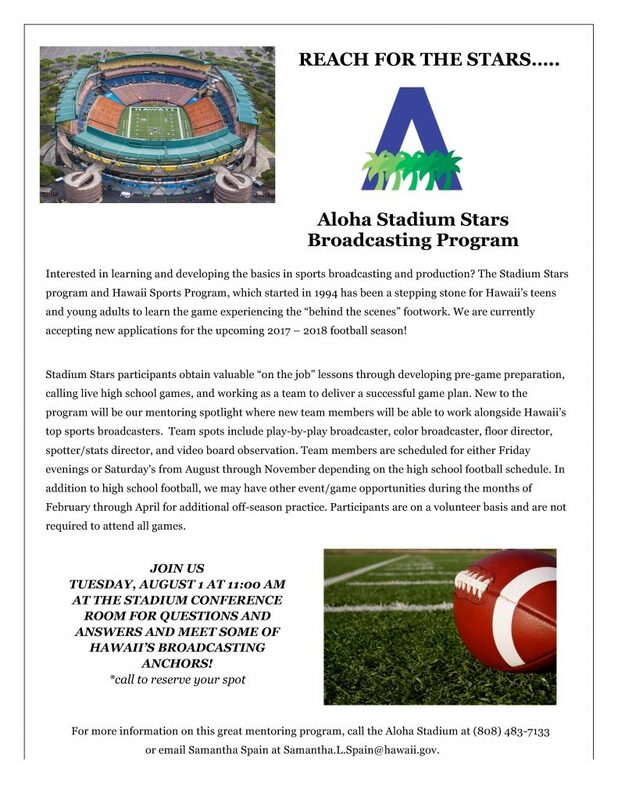 For more information on this great mentoring program, call the Aloha Stadium at (808) 483-7133 or email Samantha Spain at Samantha.L.Spain@hawaii.gov.